Is abundance something that comes from without? Without meaning outside of you. People look for abundance outside of their selves. They think it comes from money they earn, which is true and untrue. They think it comes from doing hard work, which is true and untrue. They think it depends on how much money there is in the world, which is true and untrue. They think that there may not be enough for them, which is true and untrue. You have to know what Abundance is if you hope to know where it comes from. Abundance is an energy, not printed cash. Therefore, abundance comes in many forms – you can have an abundance of money, of love, of food, friends, joy and so on. People often think of abundance in terms of money, which only makes sense. However, if you limit the energy of abundance to making money then you will find yourself on the wrong track because you will be coming from without. Abundance is an energy that we have to tune into and allow in our lives. It is a natural flow from our Source Energy and a flow that we need. When we don’t limit abundance to money from without then we open to the natural abundance that our Source has for us. We all experience some form of abundance in our lives, even if you don’t think that you do. You can’t help it, it is a natural part of our universe. The trick is to begin to recognize this. As you choose to recognize that you do experience some form of abundnace in your life then you begin to tap into this energy. 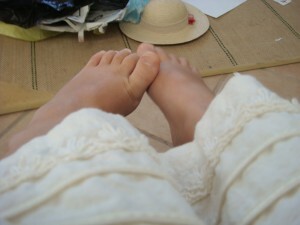 For example, my three year old daughter, who took the photo of her feet above, experiences abundance in many forms – though not necessarily monetarily. Sure, at the age of three it’s true that she doesn’t have money, but when she wants to hold money she knows where to find it. In other words, my daughter experiences abundance in many forms. One form is in her ability to take an abundance of photos (thank God for digital film/memory cards!) She doesn’t find many limits in her life: unlimited photos, unlimited laughter, playing and so on. Although some people may not be in an allowing place to recognize that my daughter is experiencing abundance, hopefully you will because herein lies the secret of this universal law! When we experience abundance within, which my daughter does, then we can’t help but find abundance without. When we are joyful inside and when we allow the energy of abundance to come into us then we slowly (but hopefully quickly) and surely begin to find abundance reflected outside ourselves. In part this is because we are holding the energy of abundance and, therefore, acitivating the Law of Attraction to bring abundance into our lives. It is similar, but the Law as within, so without more specifically stated that what you are within yourself you will see reflected outside of yourself; it’s not about what you will attract to yoruself but rather about what already is here within yourself and outside of yourself. It is a mirror. What is within yourself? Are you finding the abundance you desire inside and outside of yourself? If not, realize what abundance is and begin to allow the energy of this aspect of what you are within yourself so that what is then reflected back to you, as Who your truly are, will match the natural abundance that you truly are.